On a macro level, the who and where of my music life are as open to serendipity as the what of actually making a noise. I’ve met so many people in unplanned scenarios over the years and ended up making significant music with them. Sometimes it’s just the way people’s diaries line up that make things possible (the Sliding Doors version of my career, where all the near misses ended up happening would be fascinating, but not significantly more so that all the crazy things that have actually happened). 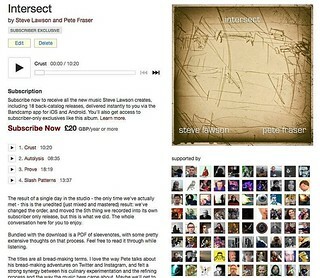 Which brings me to Pete Fraser – Pete and I didn’t initially connect because of each other’s playing. We were just politically opinionated social media types with a substantial crossover in contacts. I was actually a fan of Pete’s band Down I Go, without knowing that he was in them, so it was lovely when through his musical association with Tim Elsenburg of Sweet Billy Pilgrim-fame I got to know more about his music. We started talking pretty early on about the possibility of one day collaborating. Pete subscribed to my music on Bandcamp, which is about as firm a commitment as someone can make to actually checking out what I’m about musically. I heard bits of his sax playing, but was really more familiar with his singing and politics. So when the opportunity for a day in the studio together during a Field Music tour came up, we both jumped at it. Even that was ripe with Serendipity – the studio was a beautiful little space in North London. We didn’t need their equipment (my live rig IS my studio, so we were recording direct to that, and Pete brought his own lovely mic with him) but the space was ideal, AND had parking (seriously, when doing anything in London, being able to park and not having to drive through the congestion zone can be the decider regarding the viability of the venture). The beginning of track one on here is the sound of me showing Pete how the Looperlative works. I looped his sax, hit scramble to show what that did, and then hit record straight after, wanting to make sure we didn’t miss anything. So Pete was actually recording before he knew it, and we then joined in and just carried on in that spirit for a few hours. A brief coffee n snacks break in the middle, but we played 6 pieces and recorded 5 (the 5th piece in the sequence failed to record – I think I just forgot to hit record when we came back from snacks! – so that one will only live in our memories as the greatest piece of music ever performed by humans). It was a gloriously relaxed, zero-stress encounter with a fascinating and brilliant musician who drew out all kinds of interesting new stuff in my playing. On a geeky level it’s also the first recording that I’d done with my new MOD Duo processor, which added a layer of tentativeness to the proceedings that I really like… I’m listening harder, making slightly slower, more considered decisions, and then finding my way into each sound. We went our separate ways and resumed our internet-only communication model. What you hear is mix version 4 – in the interim I already had 3 albums lined up to be released, so it gave us the luxury of mixing, mastering and revisiting the album a number of times. I learned a couple of new mastering tricks in the meantime so updated the tracks, and they’re the better for it. There are no edits here, save the fade in on track 1 – this is what we did. In between tracks there was no musical discussion, no talk of keys, genres, no ‘you do this then I’ll do this’. Just ‘that was lovely! shall we do another?’ Serendipity stretched out over the length of the album. I’m listening to the album as I write, and smiling – there are things that Pete plays on here that are some of my favourite saxophone things ever. His phrasing is exquisite, and the way his arranger-brain kicks in and he improvises whole layered horn sections (Autolysis is particularly extraordinary in that light) is just glorious. But, aside from all that, he’s a delight to spend time with. So this is properly a win/win – new music, new friends, and a whole host of new possibilities going forward. This is definitely the opening salvo in a musical relationship that could go in many, many directions. I’m looking forward to that particular adventure immensely. PETE: I guess one thing I found, and have often felt partaking in improvised music is the sheer happy exhaustion I felt afterwards; when one is playing pre-arranged music, or even a jazz improvisation, guided to some extent by historical, cultural conventions or, at the very least, the structural conventions of the tune you’re playing, there’s always a parallel track running beside you so if, at any point, you lose your thread, or need to punch out for any reason, you have the luxury of a road-map that tells you where and, on a particular level how to find your way back. In improvised music, that isn’t there. The landscape changes before your eyes and, particularly in a duo setting, it’s your responsibility to navigate a route through it, not only observing the peaks, troughs and obstacles as they present themselves, but trying to glance up every now and again in order look ahead and find the most pleasing route from A to B. In some ways, that’s a beautifully simple exercise. You stroll along, act like yourself, and you can’t go wrong, but I also found that paying that level of attention to the entire musical environment took every ounce of concentration I had, leaving me pretty wrung out by the end of the day. I think some of the nicest moments on the recordings are where, sometimes after minutes on end of pushing together all sorts of little ideas, gently wafting the focus of the tune in subtly different directions, collectively steering it towards what felt like a good place, we’d just sit back, listen to the organised chaos of what was there in the loop, and almost have to stop ourselves from giggling in a kind of juvenile delight at the edifice that had sprung up from all those little concentrated shards of reaction and initiative. I think the nature of looping epitomises that kind of magic and whilst we try to steer away from too much cliche or subservience to the machines we use to make music, there is a sort of joy in that pull-back-and-reveal tendency that you get from stacking together a lot of ideas to create a spontaneous arrangement, both in the things you were aiming to achieve revealing themselves, and the things that surprise you. I hope some of that excitement comes across in the recorded music.